If you’re a Merseysider who has lived with crooked, crowded, spaced or twisted teeth, you may have looked for the services of an orthodontist in Liverpool. While it’s true that for certain complex conditions you will need to pay a visit to the orthodontist in Liverpool, for cosmetic adjustments, the dentists here at Liverpool Smile Studio can help you to a healthier, happier smile. We use a range of braces systems to help you achieve the look you want. Four of the brands we work with are: Six Month Smiles, Invisalign, Fastbraces and the Inman Aligner. These are a very popular option with our patients because not only are they fast-acting, they are also discreet. These braces are fixed, metal ones, but rather than blazing a glinty trail across the teeth, they blend into them. How come? Because the brackets are made from ceramic and the wires are coated in a tooth-coloured material. Because the braces only act on the front 6-8 teeth, they also do their work quickly, in 4-9 months or 6 on average. These clear aligners aren’t like traditional braces at all. They look like thin, transparent mouth guards, and use pressure points inside the aligners to nudge the teeth into position. Invisalign aligners are also removable, so easy to keep clean. 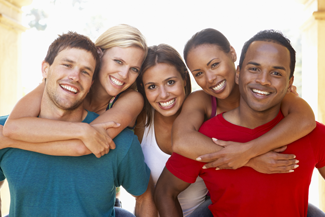 Both teens and adults can benefit from Invisalign, which takes 12-18 months to do its work. These are also suitable for both adult and teen patients. Treatment can be complete in as little as 20 weeks, hence the name. These braces use clear brackets and one tooth-coloured wire, so are very discreet. Fastbraces can treat a range of conditions, including: spacing, crossbite, overbite, open bite and crowding. This is a different kind of brace altogether. It uses 2 aligner bows to both push and pull the front teeth into position. It’s incredibly fast-acting, with results in just 6-18 weeks. The aligner is removable, so easy to clean, and is only visible through one thin wire. Do you need to see the orthodontist in Liverpool? Or is one of the above braces systems for you? Call into our surgery to find out. This entry was posted in Orthodontics on 1st February, 2019 by Liverpool Smile Studio.